The convertor I have used for converting files from 3D-studio to CAVE format is Nugraf. Nugraf contains all the functionality of 'Polytrans' software allowing Nugraf to import then translate with high accuracy scene files between all the major 3D file formats. This program is available for NT/95 operating systems on PC platforms. When using the product you must buy the plugin for exporting and importing openflight (.flt) files. The 3D-Studio geometry import plugin module imports the contents of entire 3D Studio files including all mesh data, (u,v) texture coordinates, hierarchy, pivot points, materials, lights, cameras, viewports and (optionally) animation data. The Openflight format is the defacto standard used in the VisSim (Visual Simulation) and realtime modeling markets. This is the filetype that is best supported in the CAVE. 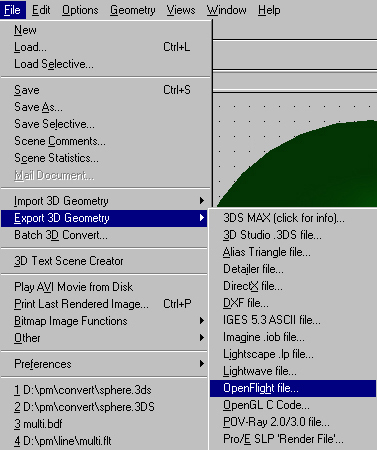 The following process describes how to convert 3D-Studio .3DS Files into Openflight format using nugraf. Once the file is in Openflight format, it can be read directly into the CAVE. 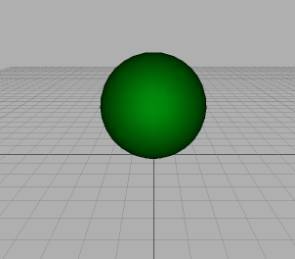 Export the model that was created in 3D Studio as a .3DS file. 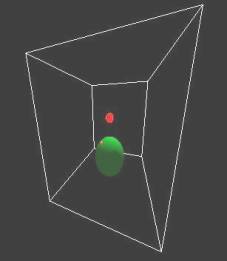 · Position, Rotation and Scale animation. If the controller is a TCB controller, the TCB, Ease In, and Ease Out values are also saved. If the controller is any other type of key controller, the keys are saved but the tangent information is lost. If the controller is not a key controller, only the object's transformation at frame 0 is saved. · Basic material color/parameters from the Standard material. · Single maps with their amount, offsets, scales, etc. · Target cameras, target spotlights and omni lights. · Most "static" parameters for cameras and lights, and animation tracks for Roll, Falloff, Hotspot, and FOV. · Composite and procedural maps. · Grouped object transformations. 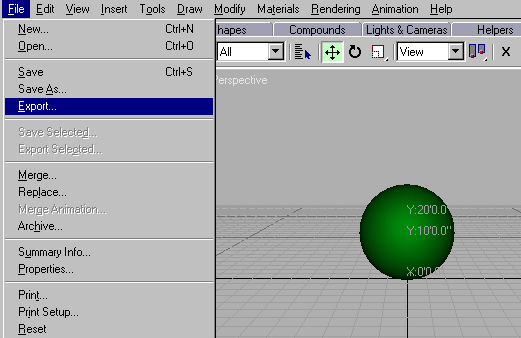 There's no concept of group hierarchy in the 3D Editor. Groups export to the Keyframer because the Keyframer understands hierarchies. · Objects are exported as they exist on the frame 3DS VIZ displays at export time. · Meshes are saved with edge display information and smoothing groups. · 3DS VIZ instances are saved as Keyframer instances. 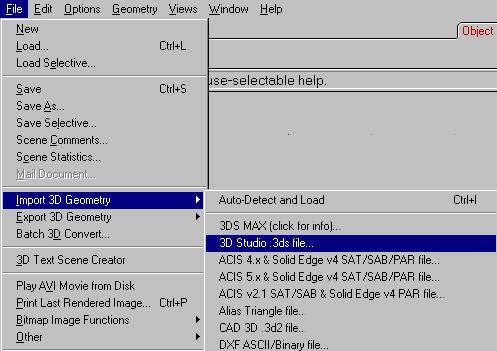 - specify an output filename with the .3DS extension. Import the .3DS file thus created into Nugraf. Browse for the *.3DS file you wish to import. The following dialogue box allows you to select what attributes you want to load. There is no need to resize the perspective camera view, because 3DS file format specifies its own default camera view. The following pop up menu will come up. · Make sure the Openflight file format version is set to 14.2. This is the file format that is read directly into the CAVE. · Go to the bitmaps tag and set the following as the same as the image below. - specify an output filename with the .flt extension. All texture maps that have been used during modeling should also be saved in this same directory. -S is the scale function and .0833 is the conversion factor from inches to feet. 1. All texture files have to be sized to powers of two. 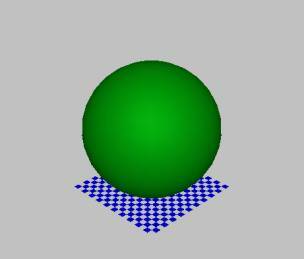 See Texture Guidelines for detailed information. 2. The CAVE reads all dimensions in feet. Therefore to relate to the CAVE dimensions it is recommended to work in feet and inches. While running the model in the CAVE it will have to be scaled down by a factor .0833 ( converting inches to feet) since Saranav reads all fields as one inch equal one foot. See Scale Guidelines for detailed information. The CAVE requires either JPEG (JPG) or GIF format for texture files, but then these files must also be converted to Silicon Graphics RGB ( red-green-blue) format while running the model in the CAVE. Download the following script and place it in your path settings. This script will automatically convert all .jpg texture files to .rgb format. 4. All texture maps used during modeling in 3D-Studio viz that have been converted to JPEG and resized to powers of two, should be saved in the same directory along with the *.max, *.3DS and *.flt files of the model and then taken to the CAVE.